Stanford's Center for Comparative Studies in Race and Ethnicity sponsored a lecture featuring Lonnie Bunch, director of the Smithsonian's National Museum of African American History and Culture on May 5. Recently, Lonnie Bunch, director of the Smithsonian’s National Museum of African American History and Culture, gave a talk at Stanford about the challenges he has faced as he develops the museum, which is scheduled to be completed in 2015. Bunch talked about the “treasures” people often bring him as potential items for the museum’s collection. Bunch told the story of a pillowcase someone brought him that had been passed among family members for several generations. The pillowcase was embroidered by an enslaved African American woman who had just learned the day before that she would be sold. According to Bunch, that mother never saw her daughter again. Bunch’s story put into perspective all the chatter about tiger and helicopter moms. There’s even a new one, snowplow parents – who try to move all the difficulties out of their children’s lives. I used to say that most of my black friends thought I was a pushover when it came to parenting and many of my white friends thought I was too tough. I’m not sure what my other friends thought. In the end, all of our children have made us pretty damn proud. Kimberly Elise, Oprah Winfrey and Thande Newton in "Beloved." Winfrey is a member of the advisory board of the National Museum of African American History and Culture. In an age when everybody’s got an opinion about how children should be raised, protected, nurtured, etc., the pillowcase story makes it all seem so silly. Who among us would have had the resolve to embroider that farewell before being sold to another slave owner? Or who would not have been tempted to do what Sethe did in Toni Morrison’s Beloved? Maybe this is a downer as Mother’s Day approaches. It’s not meant to be. It’s intended to be a tribute to mothers who, under the worst and best circumstances, did and do their best with every ounce of what they have. Here’s to our mothers, who made sure we had clothes on our backs and something to eat and who stitched together a legacy of love that has sustained us through generations. 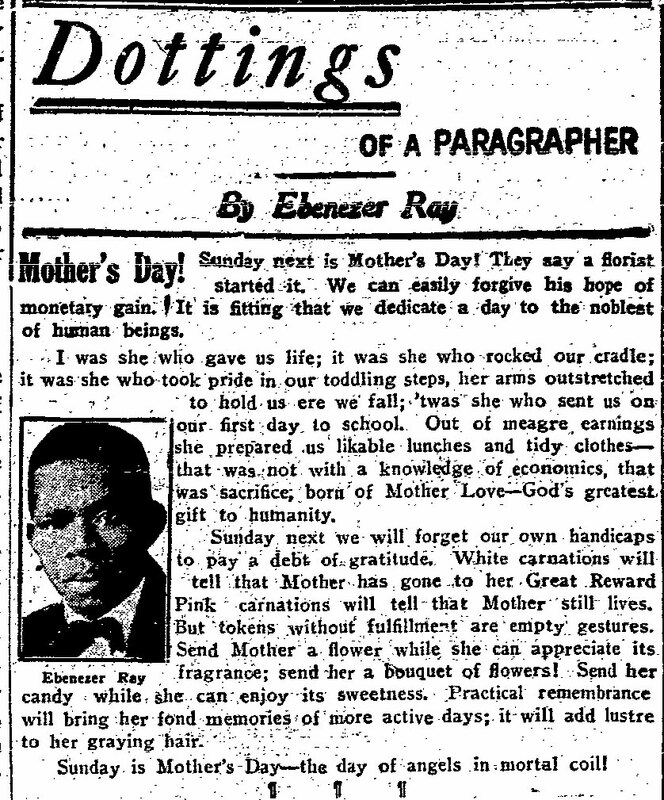 On a more uplifting note, and speaking of generations, here’s what my father wrote for Mother’s Day in 1937. Elaine, this is just so lovely and so touching.Both you and your father write very well. Is it genetic. Is it something in the genes that he passed on to you? Or, tell me, given that Mother’s Day is approaching, is it something that you inherited by way of your mother’s recessive genes. Either way, you received a gift that was well developed. Thank you for your kind words, Henrietta. I think the journalism genes came from my father’s side of the family, but I can’t even begin to count the blessings passed down by my mother. Happy Mother’s Day to you.